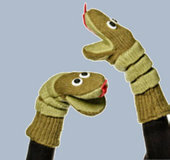 Fun puppet-like mitts enable wearer to help the snake talk up a storm. Thumbs work the bottom of the snake's mouth, while fingers work the top. Made of 100% natural wool from New Zealand. These contain lanolin which makes them water resistant and gives them a natural self cleaning effect. One size. Fits most kids age 7 through adult sizes. Cozy fleece lining throughout.